The South Burlington company enabled Tesla's battery packs to go to market and has recently landed a partnership with Samsung. 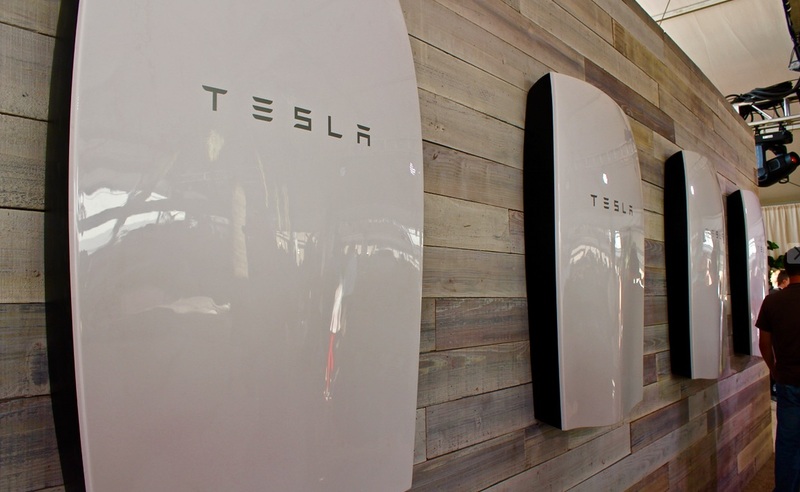 Dynapower builds inverters for Tesla's commercial battery storage systems, giant versions of the Powerwall units shown here. For a company of some 200 employees based in South Burlington, Vermont, Dynapower, a leading maker of electrical inverters for industrial-scale energy-storage systems, has a remarkably global footprint. “We are installed on every continent, including Antarctica,” says Dynapower spokesperson Richard Morin. And as cities, countries, and businesses increasingly see advanced energy storage as key to a more sustainable and resilient power future, the company is positioned for strong growth moving forward. Tesla’s Powerpacks help utility customers like Duke Energy and Nextera to incorporate more renewable energy sources, using battery storage to smooth out dips in supply and surges in demand, and to build resilient “microgrids” that can operate independently when necessary. And they are being purchased by a growing number of industrial and commercial customers both for emergency backup (hurricane, anyone?) and to cut internal energy costs by letting them bank electricity in so-called “behind the meter” batteries when prices are low, and to run on the stored reserves when prices surge. Market research firm IHS predicts major growth in energy-storage projects, from an installed base of 6 gigawatts (GW) in 2017 to over 40 GW by 2022. Although Tesla recently started shipping Powerpacks that contain their own proprietary inverter units, Dynapower continues to service existing systems and to help Tesla fill gaps in supply. In late 2016, Dynapower also launched a partnership with one of Tesla’s main energy-storage rivals, South Korean electronics giant Samsung, to provide energy-storage inverters that are coupled with Samsung’s batteries in their industrial storage systems. But energy storage is just one part of Dynapower’s portfolio. The company’s industrial-scale power electronics systems – rectifiers, custom transformers, and frequency converters – are widely used in the automotive and other industries for electroplating and anodizing metals, in the mining and processing of gold and copper, and in numerous installations for the U.S. military (frequency converters for the Patriot missile program, and facilities that “demagnetize” submarines to help them evade detection, for example). Founded in 1963 in Detroit, Dynapower moved to the Green Mountain State in 1983, when the owner’s son took over the business after graduating from the University of Vermont. The current facility is somewhat unusual in combining R&D and manufacturing in its 150,000-square-foot South Burlington plant, which helps creates a dynamic work environment. “We have engineers with Ph.D.’s next to guys who are building things,” says Morin. “Our advanced manufacturing skill set is amazing.” While staying cost-competitive is a challenge for a Vermont company at Dynapower’s scale, the state’s openness to innovation – particularly around the smart energy sector – is a major plus. “The state is like an incubation center for new technologies,” says Morin. Dynapower is currently “hiring selectively,” he says, with a particular focus on candidates with advanced degrees in electrical and mechanical engineering. But some soon-to-be announced new products and partnerships could mean even more growth ahead for this under-the-radar powerhouse.